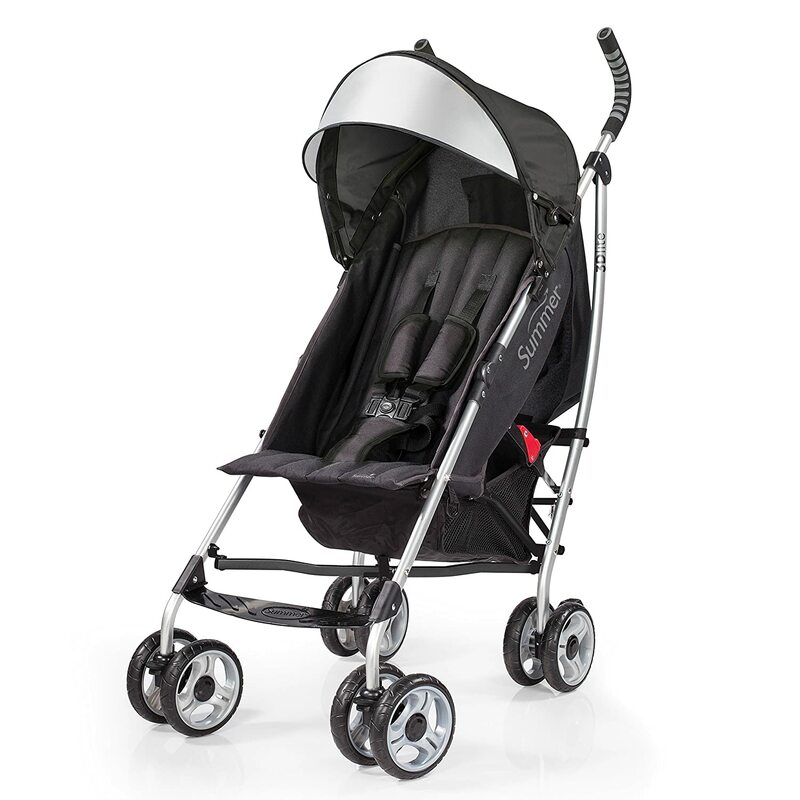 The Zoom 360 Ultralight is a fairly recent product of the Joovy jogging stroller line. The price is relatively cheap for its quality. On Amazon, you can buy it for the only lowest price. It is 10% lighter than its previous version. Its new weight is 25.7 pounds. Made of 6061 aircraft aluminum its new design is even better looking. It has the weight capacity of 75 pounds (but maximum weight recommendation is 50 Pounds). In the back it has 16-inch air filled tires and the front is a 12.5-inch air filled tire. Comes with a tire pump. I was literally blown away at how compact it was. I could fold it easily, pop off the wheels and put it in the trunk of my car. So basically I could take it anywhere I want (From shopping mall to my yoga class, you name it). By far it has the biggest canopy I have seen and it provides a ton of shade for my son and it is important for my son because he likes to take a nap while I am jogging. Also on the back I can uncover the window and can see my son and play peekaboo with him. For a mom, that is a fun experience and I just love it. Furthermore, the large air-filled tires make it great for almost any terrain. The front wheel is swivel wheel and it will give you terrific maneuverability but I can also lock it if I want. There is also a large basket underneath the seat. When I go to jogging I need to have a lot of things for my two-year-old son. I need to have his diapers, his toys or sometimes his jackets and I can put all of these things there with no problem at all. Wheels can be taken off and the product will become lighter. Shock absorbent suspension of this jogger gives the baby a smooth ride with fewer bumps. Comfortable seat for the baby. Don’t have to worry if the tires get low because of the free tire pump. The handle does not appear to be adjustable. BOB 2016 Revolution FLEX Jogging Stroller Offers nine positions to create the perfect fit for parents of all heights. A lot of parents actually love this fact. For short women, the adjustable handlebar is a very useful feature that Joovy Zoom 360 Ultralight Jogging Stroller does not provide. In the end, there are some people who may not be a big fan of it but for me it is a home run. It runs very smoothly, my son loves it and fits great in it. The quality is great for the price. I must say that this is the best single-child running stroller out there in the market. According to some of my neighbors, BOB 2016 Revolution FLEX Jogging Stroller is better than Joovy. But before buying Bob think about the price for a second. Joovy Zoom 360 Ultralight Jogging Stroller is way cheaper than BOB 2016 Revolution FLEX Jogging Stroller .If you consider both price and quality, I believe Joovy Zoom will be the better option and I highly recommend you to go for Joovy instead of Bob. Trust me, you won’t be disappointed. 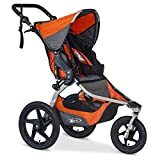 The BOB Revolution Flex is the perfect on and off road running Stroller, for open-air devotees and urbanites alike, safeguarding families exuberant for the years to come. So whether you support an enthusiastic training session or a fine long walk, the Revolution Flex is the ideal Stroller. This Stroller is incredibly flexible. The front wheel swivels, which supports for easy mobility through parks, city avenues and other tight spots however furthermore bolts included, adjust when walking or going up against harsh landscape. The Revolution Flex gloats an ultra-smooth ride for your little traveler. Footpaths, seashores, and trails are no fit for this stroller. When you are completed for the day, crease the stroller in seconds and go ahead. The BOB inspires by being an awesome running stroller that capably explores swarmed spaces and harsh landscape. It has the Urban Glide’s smooth run-capacity and offers a more tough look. This settles on it an awesome decision for those that esteem the demonstrated strength of a BOB over littler size and lighter weight. We would suggest this stroller for families love’s identity outside and plan to get out of the way frequently. Best in class customizable deferment contraption gives three creeps of excursion and 2 scopes of weight bolster for an ultra-smooth ride. Simple, two-advance overlap for helpful transportation and capacity. Travel device arranged when utilizing the BOB Infant Car Seat Adapter (sold independently); Pair with a coordinating BOB B-Safe 35 Infant Car Seat by Britax or with some other basic organization car situate. Movable cushioned handlebar offers 9 positions to make the perfect suit for father and mother of all statures. Swiveling-locking the front wheel swivels to move tight turns effortlessly or bolts forward for enhanced adjust when running or on a troublesome region. Front wheel swivels for helpful mobility with bolt work for expedited consistent quality when strolling or freeing troublesome region. Cushioned 9-position handlebar without issues alters for a perfect fit. Movable deferment contraption gives 3 creeps of movement and 2 degrees of weight support to deal with any landscape for an ultra-smooth ride. Simple, one-hand movable seat with the altogether upright alternative. Two-advance overlap for advantageous visit and capacity. Polyester dobby weaves textures with water-repellent covering and open-cell froth cushioning. Travel framework very much coordinated with BOB infant auto situates connector and BOB B-Safe newborn child auto seats. It is an amazingly made item that is solid and ideal for any climate conditions, for example, those blanketed slushy essentials you get in stormy climate parking areas. In any case, it flies up and goes down genuinely easily.It’s too little of a space that very easy to carry. The wheels are very easy to take off. There is a simple quick-release button that you depress and then just pull the rear wheels off. The front wheel is also designed with a quick-release for easy removal. 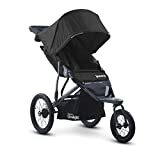 The folded dimensions with all 3 wheels off are 35″ L x 24.5″ W x 10″ H.
The BOB Revolution FLEX is the ideal on-and rough terrain running stroller, for out of entryways lovers and urbanites alike, keeping families energetic for the years to come. So regardless of whether you support an energetic training session or a top of the line extensive walk, the Revolution FLEX is the best stroller. The Revolution FLEX brags an ultra-smooth ride for your little explorer. The fresh out of the box new movable suspension framework takes knocks in the walk. Footpaths, shorelines, and trails are no fit as a fiddle for this stroller. This stroller is incredibly flexible. The front wheel swivels, which lets in for easy mobility through parks, city boulevards and diverse tight spots, however likewise bolts for brought adjust while going for strolls or going up against troublesome landscape. The handlebar changes, providing 9 positions to allow the best fit for father and mother of select statures. For convenient transportation and capacity. It isn’t light and weighs more than 25 lbs which aren’t generally an issue until the point when you are completing it in and of the auto a lot.It’s flawlessly best for an infant in a Bob Car Seat. It does fold up but not super small so it takes up a decent amount of trunk space. However, this is the situation with the majority of the running strollers of this compose. It’s a surprising stroller for consistently utilize. These days’ modern parents must have a baby stroller and they consider it as a very important item when their family grows. Most parents know how it feels to carry a baby all the time. A stroller makes it so much easier for them to move their babies around. Thanks to this product they don’t have to carry their babies all the time. That’s the greatest advantage of a stroller. It can take your kid off your shoulders providing you ease and comfort. There are overwhelming numbers of strollers in the market and you may become confused about the product you should buy. Well, now we are going to talk about Baby Trend Range Jogging Stroller and it will definitely clear your confusion. For many years Baby Trend has been making solutions to make your daily life easier. As one of the worldwide leading manufacturers of baby products, the company always tries to provide affordable and excellent products and in the process, they have come up with this stroller so that you can take your baby anywhere you want. The Baby Trend Range Jogger is a 28.8-pound stroller made from metal. It has the weight capacity of 55 pounds. The Stroller features hi-impact lightweight composite all-terrain wheels. It has a locking swivel wheel which allows you to lock the front wheel when you are jogging and you can also unlock it for low speed strolling. It has all the features to make your life easier. You will have countless cool features like – comfortable handle, parent tray, child tray, secure seat, canopy and many more. You will have all of them with just one product and its price is very low. Extra wide and ergonomically shaped rubbers handle to control the stroller. The front wheel is a swivel wheel and it can be locked and unlocked at will. Has a quick release trigger fold. The jogger features a Child tray that has two cup holders. Can provide infant car seat (It is sold separately). Has adjustable five-point safety harness and tether strap so. Hence the jogger is always within arm’s reach. The tires are just outstanding for almost any terrain. The front wheel is swivel wheel and it will give you terrific maneuverability but you can also lock it if you want. So you can take the product anywhere you want without even breaking a sweat. Furthermore, it can also fight with snow because of its large wheels. So you know that nothing can stop you. Its adjustable Canopy will protect your little one from the sun and it will keep your child at ease.You will absolutely love the fact that you can adjust the canopy back and forth to account for different sun angles. On the back, there is a peekabo window. So you can easily keep an eye on your kid. Its convenient trigger fold will make it easy for you to store and transport the jogger anywhere you want and we all know how important it is for parents to have the stroller wherever they go. One of the things that you will really like is the parent tray that can hold two cups or bottles. So you can put your water-bottles there and can have an easy access to them when you need them.The stroller has a child tray that also has two cup holders and you can put milk bottle or sippy cups there. Like you, your child can also have easy access to them. You can be assured of the fact that you will not have any kind of storage problem. Under the stroller, there is a large covered storage. So everything you or your baby need is within easy reach. You can put your baby’s diaper, toy or anything you want. In addition, if your baby is under six months old you can buy Baby Trend Infant Car Seats which can be attached to child’s tray to create a travel system. Although, we must recommend you not to jog with your infant. It can be harmful. Super simple to unfold and collapse. Wheels can be taken off. Comfortable and safe for your babies. The product is durable and lasts longer. It can carry a lot of things. Obviously, Baby Trend Range Jogging Stroller is not the only product on the market. There are lots of other products like this. 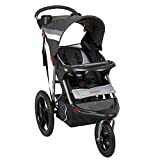 Joovy Zoom 360 Ultralight Jogging Stroller and Baby Jogger City Tour stroller are two of the products that can be seen as competitors for Baby Trend. Although Baby Jogger City Tour stroller is a lot lighter than BABY TREND (14.21 pound), its weight capacity is really low. Also, its price is on the higher side compared to the Baby Trend Range Jogging Stroller. Now if you talk about Joovy Zoom 360 Ultralight Jogging stroller, it is also a little lighter than Baby Trend Range. Its maximum weight capacity is better than Baby Trend and you can have a free tire pump with it. But it can be way too costly and expensive for a lot of parents. Also, it does not have an adjustable canopy. The baby stroller has become a must-have item for parents and Baby Trend Range Jogging Stroller is one of the best in the market when it comes to safety, comfort, and quality. It costs less than some of the other quality products in the market. So you do not have to worry about the product. The quality of this product is great for its price. If you are thinking about buying a stroller, go for Baby Trend Range Jogging Stroller.You will not regret buying it.